Happy Thanksgiving from all of us at Infinity! I recorded a short meditation in case you need to take a break today. If you’re my student you’ll recognize it as a version of the gratitude meditation I sometimes lead during Savasana. You can find more meditations here . The two most common compliments I hear from new students is how warm and welcoming they found Infinity, and how much they loved their teacher. I am so thankful to be a part of our Infinity community! I am also honored to get to be a part of your self care as we enter the holiday season. Speaking of this, Jacque shared this Personal Awareness Worksheet which is helpful for students in any discipline. 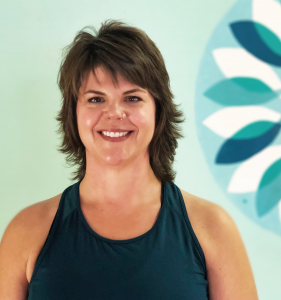 Mollee’s Candlelight Yoga class will transition to a special once-a-month event, held on the first Wednesday of every month from 7 – 8:30pm, beginning December 5. Monthly Candlelight includes a gentle yoga sequence designed to calm the nervous system, heal stress, and shift into a more relaxed state. Each 90-minute class includes an additional practice such as meditation, mantra, yoga nidra, energy work, or breathing practices. Pre-registration cost is $10 or an Infinity card punch. Drop-in rate is $15. 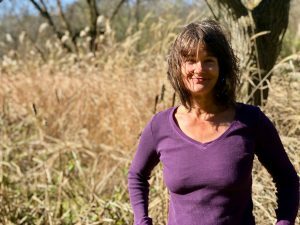 The switch to once per month will allow Mollee the time she needs to work on her advanced trainings in Yoga Therapy, Ayurveda, and Traditional Wellness Counseling. She looks forward to sharing new practices with students in her classes, workshops, and private one-on-one sessions. 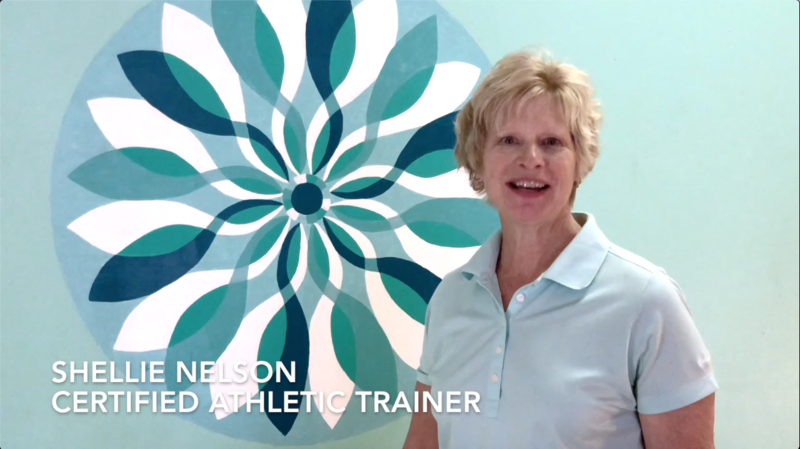 You might recognize Shellie Nelson as a regular yoga student. She also offers Corrective Exercises at Infinity. If you have a long-term ache or pain that just doesn’t seem to get better no matter what you try, this is a great option. If you have a newer injury, get it assessed before it becomes a long-term pain! Eri is leading the last SomaYoga series of the year in November. Though students are welcome to drop in anytime, for the most benefit you’ll want to attend all 8 sessions in this series. For those of you committed to attending all 8, Alanna is offering the special price of 8 classes for the price of 7. 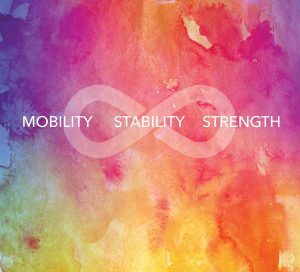 You will find the Asana with Alanna Series under our studio events. Alanna has decided to give those of you who are committed to all 8 classes in her series a break on the price. Thanks to everyone who’s given feedback on our new emails and especially to our teachers who have been taking time to contribute. If you’ve been keeping up the newsletters or practicing at Infinity for a while, you hopefully know April Herndon. But even if you take her classes weekly and think you know her well, her video is worth watching. April embodies a comfortability with herself that makes sharing a room with her a pleasure. 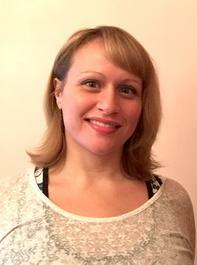 April teaches Restorative and Yin Yoga weekly, and on the last Sunday of the month she leads Yoga Nidra. Even if you haven’t tried Yoga Nidra yet, chances are you’ve heard of it. Known for its healing benefits and stress reduction, there’s truly no better to way to start your week. Jacque Paulsen – Shoulders, Elbow, Hands, and Wrists. Though students are welcome to drop in anytime, for the most benefit you’ll want to attend all 8. For those of you committed to attending all 8 sessions in a series, Alanna is offering the special price or 8 classes for the price of 7. Make sure you read through our schedule carefully this week: Mollee’s got subs for her classes and Eri’s SomaYoga is beginning this Tuesday. It’s Eri’s last series this year, so you don’t want to miss it. We’re also excited about a new partnership with Bluff Country Co-op! Read more about this in the upcoming events. Have a great week of practice! Speaking of changes in our schedule, you will also find that Alanna’s class has changed names. It’s now Asana with Alanna. For those of you who know Alanna, you can imagine her delight at the alliteration! Even beyond the poetics, this name is a good a fit for her teaching style. In Yoga Sutras of Patanjali, asana is defined as a “steady, comfortable posture.” which describes Alanna’s teaching style perfectly! 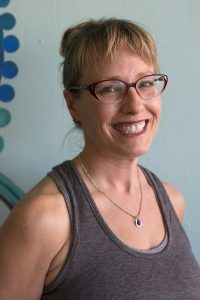 Alanna’s training is in Vinyasa Yoga through Yogafit, but her personal practice and teaching is shaped by 15 years of Iyengar Yoga. Her classes feature Iyengar inspired alignment, and gentle Vinyasa cuing. Alanna often uses props in her teaching to help students support themselves in poses. 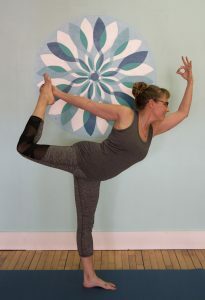 Beginners have nothing to fear, as her classes move at an accessible pace, and Alanna is a pro at helping students find the right version of a pose for them. 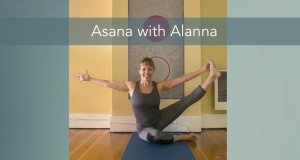 Asana with Alanna is taught in an 8-week series as a way to help her experienced students build towards more complex poses, while still maintaining an accessible environment for the newbie. As Alanna discovered in her own practice, this kind of consistency has rewards. One week’s class sets you up for the next. Alanna describes her own experience with her teacher, Francie Ricks: “Many times I’d find myself craving poses without knowing it was the theme for that night’s class.” Alanna’s goal is to give her own students the opportunity to experience what a consistent rhythm of practice can do for them. Though students are welcome to drop in any time, it is especially rewarding to attend all 8 classes in the series. For those of you planning to attending all 8, stay tuned: Alanna and I are creating some special pricing to reward you for your commitment. The next series will run November 29th – Jan 24th (no class Jan. 3rd). Alanna Pelowski – Inversions: new perspectives. Jacque Paulsen – The Chest. Elle Newman – Love Your Backbends. Bluff Country Co-op has partnered with us to offer you a free yoga class in the Co-op’s Community Room on the 2nd Tuesday of each month. De-stress and re-focus while getting your yoga fix during the lunch hour. This all-levels 45-minute yoga sequence will help create balance in the body and mind and, of course, connect with and honor the light within us all. 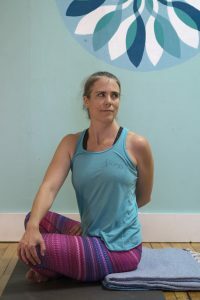 Alanna teaches her Asana class with a cycle of themes, beginning with Standing Poses and ending with Twisted Postures, with a Restorative Yoga class in the middle. Each class is an in depth exploration of the theme, with poses suited for beginners as well as opportunities for advanced students to practice more complex poses. Though students are welcome to pick and choose the classes they attend, you will make the most progress by attending all of them. Make sure you check out our weekly newsletter to learn about the current week’s theme. I’ll admit it, there was a time, not very long ago, that I avoided any class with a backbend theme. 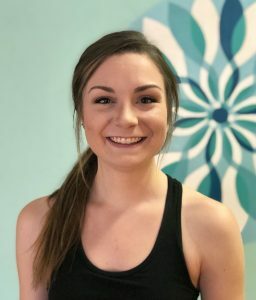 So I thought I would share a little of my own journey that helped me appreciate backbends in my own practice, and hopefully made me a better teacher. If you already love backbends and are just curious about themes, skip to the bottom. 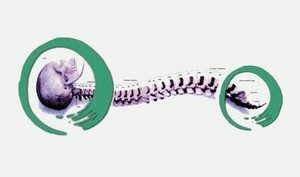 I understood how opening up my front body would help those tense spots in-between my shoulders feel better. I understood how opening through my front body could help me into that oh- so-lovely energetic open heart feeling. Hate might be too strong of a word but I really really really really really REALLY didn’t like backbends. The road to enjoying backbends wasn’t a short one for me. First came acceptance of my mobility the way it was. Rather than force myself, or internally repeating things like “I’m not good at this, my back doesn’t bend this way, I don’t like this, I don’t like this, please be over…” to myself while I practiced, I relaxed. I promised myself that I wouldn’t push myself too far, I decided it was okay with me that I didn’t move that way… in other words I found acceptance; I just accepted the sensations. Slowly, though, my ribcage started to relax and open. I had been working with Sharon Mansur in private somatic sessions and she noticed how rigidly I held my ribcage. When she first asked me to relax it towards the ground while I was laying on the ground I had no idea that was a part of my body that I could move! But I started getting curious and playing with softening through my ribcage, finding mobility there. I noticed a new openness in my low cobras in Sun Salutations as well. Lo and behold, it was becoming not just a pose I had to get through to be able to get to Down Dog, but a pose I enjoyed. It was starting to actually feel good to open up. In classes like the ones we’ll have this week where we are purposely exploring backbends, we will warm up and support ourselves with care. Talk to me about any injuries or concerns you have before class and we can make sure your backbend experiences are good ones. Warm up and open up to your week. As you might know ,Mondays are usually inversion days. 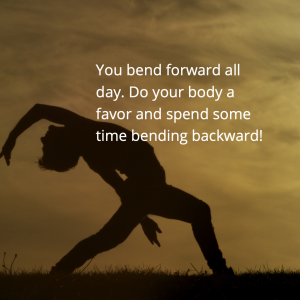 Uncertain how backbends relate to inversions? You’ll have to show up to find out! Bring your backbends into Sun Salutations and B Series with Vignettes. For those of you who have already had a backbend class or two this week, this will be the perfect way to celebrate your newfound openness and recover from any soreness. If this is the only class you make this week, it will be a great refresher on getting the most out of your cobras. We’ll be getting into the nitty gritty of how to support yourself. This is a great class if you want to spend time getting deeper into your backbends, and it’s a great class to address your questions. Let me know what your questions and concerns are ahead of time so I can better support you. Ahhh, heart openers. If you’ve been practicing with me all week, don’t miss this class. And of course it’s great for everyone looking for a gentler practice as well. We’ll explore the nuances of opening up within your range of motion using gentle backbends and lots of support. We’ll end with a delicious heart opening meditation. CranioSacral Therapy (CST) is a gentle, hands-on approach that releases tensions deep in the body, relieves pain and dysfunction, and improves whole-body health and performance. Through the end of the year, CranioSacral Therapy is just $40! This week our featured instructor is Hailey Richter, who developed Interval Flow at the request of Dr. Kristin Noble. It’s the perfect class for a yogi who wants more cardio in their life without spending hours on a treadmill. Interval Flow is yoga-inspired HIIT (High Intensity Interval Training) class. Hailey demonstrates moves that are perfect for the beginner as well as more advanced versions once you’ve built up your strength. Check out this video to learn more about Interval Flow and get an idea of what a class entails. Jacque Paulsen – This week we will be focusing on the base of the body: Feet, Knees, and Pelvis. Learn More Here. Elle Newman – Cultivate Joy. Learn More Here. Eri is leading one more SomaYoga series this year this November. *unless otherwise noted, all classes run an hour. Cultivating joy in my life both on and off my mat is an important part of my personal practice, and I love to share it as an instructor. Every time we choose to attend to our practice, and to ourselves, it’s like we’re storing up joy for our future. We’re taking care of our future selves’ mind, body, and spirit! Any practice that is truly transformative will have its challenges but that doesn’t mean every moment is drudgery. Even within in a single pose, part of us might be working hard, but then another part of us gets to release. This week (10/29 – 11/3) in class we’ll be tracking down and growing our joy. Below is an idea of what you can expect in my classes. Turn your frown upside down with inversions. Joyflow. Using Sun Salutations and Flowing poses as a metaphor we’ll explore following your Joy. 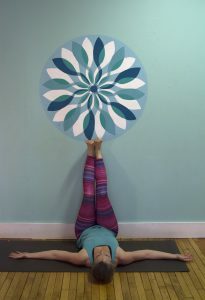 Using the wall as support, we’ll explore triangle, half moon, and more. We’ll be playing with balance poses and ending with a meditation geared towards brining more joy into our weekends. Interval Flow is a yoga inspired HIIT (High Intensity Interval Training) class, led by Hailey Richter. HIIT is a very efficient way to develop cardiovascular strength and is great for anyone who enjoys yoga but wants to introduce a little more intensity or cardio into their routine. Hello, as you can see this newsletter is moving to our new Infinity Blog. Just as before you’ll get each week’s schedule along with upcoming events in your inbox, but in a beautiful new format with more information. 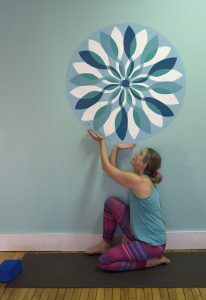 Qi Gong and T’ai Chi instructor at Infinity, she is responsible for the beautiful murals on the walls. This video is filmed on the land behind Lynn’s house. It’s so inspiring to watch Lynn practice in a nature setting, especially one that she loves. Elle – Lets Get Our Twist On. Learn more here. April – Yoga Nidra. Learn more here. If you can still the mind, you can reach the place that is called wuji: in that state the mind is calm, the body is relaxed and the energy can flow naturally and smoothly and reach the proper balance by itself. *Special thanks to Brett Terpstra for filming and editing. Every last Sunday of the Month April leads Yoga Nidra. Yoga Nidra is often referred to as “yogic sleeping” and is a guided meditative practice almost anyone can do. 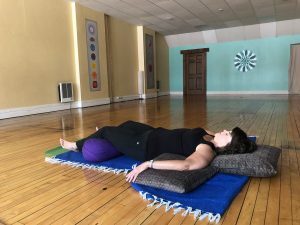 Yoga Nidra is very gentle and only requires that you can lie comfortably on the floor or sit comfortably in a chair and follow the sound of April’s voice during your time together. Practitioners of yoga nidra often say that 20 minutes of yoga nidra is equivalent to two hours of sleep, and the benefits of the practice continue outside of the time spent in class. I almost went with the more yogic sounding title, “Unwinding to Unwind” but I’ve been singing, “Come on Baby Lets Do the Twist” all day. Below are the ideas I have for my classes this week. Please reach out to me if you have any questions or concerns. We’ll start the week by getting twisted! Expect eagle arms and legs added to poses you love, as well as some extra twists in sun salutations and standing poses. Fridays are typically flowing classes and this is no exception, we’ll wind our way into twists and binds to enjoy unwinding and opening up. We’ll be exploring and unlocking the mysteries of outer and inner rotation in our warriors and down dogs. Learn how practicing with this awareness can strengthen your poses. Expect to gently wring out the stress of your week. This gentle winding/unwinding practice is designed to sooth your mind and leave you feeling centered and relaxed.